The Volkswagen Passat and Polo are fitted with the Bosch 5.7 ABS pump (Advanced Braking System) control modules but unfortunately this particular pump has been found to be a very common failing part. If the vehicle has “Traction Control” there will be processes for ESP (Electronic Stability Program) within the ABS pump, however some vehicles also have an extra ESP module which communicates with the ABS pump. 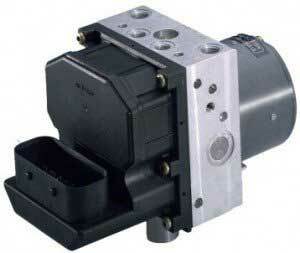 These can also be referred to as an ABS Pump, ABS Module, ABS ECU,ABS Controller, ESP module and ESP Pump etc. So how can Sinspeed help you? We have the facilities to fully Test & Repair all Volkswagen Bosch 5.7 ABS Pumps. They are manufactured using genuine OEM components that meet and exceed OE specifications to ensure that all ABS Pump modules are produced to the highest quality. When re-fitting back to your vehicle it will be fully plug and play with no programming required, and will come with LIFETIME Warranty on all repaired units! Below is an extensive list of the common part numbers we’ve found associated with this type of ABS module. Please do not hesitate to call us on 0844 847 9999 if you have any further queries, and we’d be happy to assist you. Tags : 0014461089, 0265 225 059, 0265 225 133, 0265 225 135, 0265 225 136, 0265224011, 0265224012, 0265224013, 0265224085, 0265224086, 0265225005, 0265225006, 0265225124, 0265225138, 0265225139, 0265225140, 0265225141, 0265800003, 0265800008, 0265900043, 0265900048, 0265950002, 0265950004, 0265950006, 0265950012, 0265950036, 0265950055, 0265950056, 0265950061, 0265950062, 0265950063, 0265950065, 0265950067, 0265950073, 0265950076, 0265950084, 0265950087, 0265950118, 0265950120, 0265950127, 0265950130, 0265950135, 0265950145, 0265950149, 0265950150, 0265950159, 0265950160, 0265960357, 0273004573, 0273004574, 0273004576, 0273004578, 0273004957, 1 60 kW 04.2000 -. 05.2006, 1265800003, 1265800008, 1265900001, 1265900009, 1265900048, 1265950002, 1265950004, 1265950006, 1265950012, 1265950036, 1265950054, 1265950055, 1265950056, 1265950061, 1265950062, 1265950063, 1265950065, 1265950067, 1265950073, 1265950076, 1265950084, 1265950120, 1265950127, 1265950135, 1265950149, 1273004573, 1273004574, 1273004576, 1273004957, 3U0 614 517, 3U0 614 517 B, 3U0 614 517 C, 3U0 614 517 D, 3U0 614 517 E, 4405005080, 4B0614517B, 4B0614517BC, 4B0614517J, 4B0614517M, 4B0614517S, 4B0998375, 4BO614517G, 4E0 614 517 B, 4E0 614 517 C, 4E0614517AD, 4E0614517AN, 4E0614517BF, 4E0614517BG, 4E0614517BJ, 4E0614517C, 4E0614517M, 4E0614517R, 4E0614517S, 4E0998375, 6Q0 614 417, 6Q0 614 417 A, 6Q0 614 417 B, 6Q0 614 417 D, 6Q0 614 417 E, 6Q0 614 417 F, 6Q0 698 417, 6Q0614117, 6Q0614117B, 6Q0614117D, 6Q0614117E, 6Q0614417, 6Q0614417B, 6Q0614417D, 6Q0614417E, 6Q0614517, 6Q0614517A, 6Q0614517D, 6Q0614517E, 6Q0614517K, 8E0614111AQ, 8E0614517B, 8E0614517L, 8E0614517N, 8E0998375K, 8H0998375C, 96453241, 96484353, A 0015409045, A 0015409845, A 0025401145, A0014461089, Passat 2.3 10.1996 -. 11.2000, Passat 2.5 TDI 08.1998 -. 11.2000, Passat 2.8 01.1997 -. 11.2000, Polo 1.0 16V 07.2002 -. 05.2005, Polo 1.4 Limousine 07.2003 -. 05.2007, Polo 1.4 TDI 07.2003 -. 05.2007, Polo 1.6 Limousine 07.2003 -. 05.2007, Polo 1.9 SDI 11.2003 -. 05.2007, Polo 2.0 05.2002 -. 07.2006, Polo Sedan 2.0 11.2002 -. 07.2006. WV TOUAREG V6 3.0 DIESEL FROM 2005, ABS Faulty, ESP light on, fault come on diagnose machine : ”Brake pressure sensor”. Could you please let me know if it can be fixed, and how much it will cost me including the label. I have sent over an email with pricing and further information regarding the repair on your VW Tourareg. Vw jetta 2007 1.9 tdi esp light on permanently how much to repair? We have sent you an email with full pricing and information including costs for our fitting service if required. Sounds like a no-communication fault, which is fairly common for this vehicle. We’ve sent you an email with full pricing and information. Thank you for your enquiry, and many apologies for the delay in getting back to you. I have sent over an email with pricing and further information. Hi, I have a VW Golf FSI 2.0 litre. built in 2006. The ESP light has just come on permanently. How much will it cost to fix? We have sent you an email with full pricing and information for both an own-unit rebuild and also a replacement ABS unit which we readily keep in stock as this is a very common failing part.